April is Stress Awareness Month so today I wanted to share some of the things I do to keep stress down in my daily life. Between work, marathon training and everything else going on, the day can get quite hectic. So instead of being frazzled and stressed, I try to incorporate these in daily to calm down. I’ve been meditating for at least 5 minutes daily ever since January 1st. It helps me get the day started on the right foot by sitting down and letting all the thoughts go from my mind. I can’t be the only one who wake up and their mind starts racing with thoughts, right? Getting out and moving, especially when I’ve been sitting at a computer all day. I at least get out for two walks with Vinnie every day and I’m also trying to get out for a walk during the workday. But, of course, it would help if the weather would cooperate with me. I love knitting, it’s a calming activity that doesn’t require too much thought. Especially the projects that I’m working on right now. All but one I’m at the point where I can just go without looking at the pattern. Plus, I get homemade clothing and accessories in the end! I am addicted to podcasts. I am subscribed to 50+ and I usually keep up to date with them. Usually, right now I have over 20 hours to listen to. But it’s a good way to keep entertained during work and since Mike and I listen to the same ones, we have a lot to talk about. One thing I’m trying to get into is reading a little bit before bed. It helps me wind down before going to sleep. I don’t do a ton of reading during the day otherwise so it’s a way to mix up my entertainment. 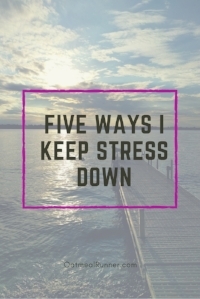 What are some things you do to keep your stress down?